Tewksbury Gas Prices How Can I Support Your Tewksbury Today? Meet Our Adoptable Pet Of The Week: Jordan! Jordan needs a forever home. Is something missing from your life? A loving, furry friend perhaps? 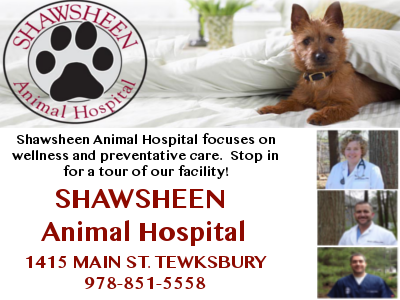 Check out the Your Tewksbury Today Pet adoption page, powered by the Lowell Humane Society and Pet Finder and sponsored by Shawsheen Animal Hospital! Click here to check out dozens of awesome dogs, cats, bunnies and more, all up for adoption. In the meantime, meet Jordan!! He is our Adoptable Pet of the Week from the Lowell Humane Society! Jordan is an active 3 year old boy who loves attention and walks. He's a goofus who loves a good roll in the grass and enjoys the occasional shoulder massage. When he's tuckered out from a play session with canine pals, this bug eyed boy will kick back his frog legs and relax in the shade. His home choice would include adults or sturdy, dog savvy kids. He loves to play with dogs, big and small, but strongly feels that Dogs Rule and Cats drool, so no cats please! If you are interested in adopting please visit the shelter or you may inquire via email - info@lowellhumanesociety.org or call 978-452-7781. We are closed Mondays and Holidays. Please be aware - because of the number of animals coming in and out of the shelter, the pet you are interested in may have already been adopted.